On January 10, VTA’s Board of Directors directed staff to begin comprehensive community engagement on the proposed 2019 New Transit Service Plan, which is a revision of the previously adopted 2017 Next Network Plan. minimize service reductions affecting residents in South Santa Clara County. By keeping bus and light rail at current service levels, VTA projects it can save approximately $15 million annually when compared to the cost of implementing the 2017 Next Network Plan. This is an estimated four percent lower cost. VTA is now seeking public input on the draft 2019 New Transit Service Plan over the next several months. We encourage you to visit the website to learn more about the plan and the engagement process, and to provide your comments, questions, and feedback. The public is also encouraged to attend a community meeting (dates and locations below) or invite VTA staff to meet with your organization or neighborhood group to discuss the plan. VTA is facing a $20 million structural deficit in fiscal year 2018 and $26 million in 2019. At its December 6, 2018, meeting, the VTA Board of Directors unanimously approved recommendations from VTA’s Ad Hoc Financial Stability Committee to address these immediate and long-term financial challenges to ensure transportation sustainability for the South Bay. Currently VTA operates about 1.52 million hours of bus service and 156,000 hours of light rail service annually. The 2017 Next Network Plan would have maintained most bus hours but increased light rail hours by 36,000 to accommodate a new light rail line (Orange Line) linking Downtown Mountain View, the Milpitas BART Station and the Alum Rock Transit Center. To focus on ridership, staff has proposed trimming some low-performing bus routes and investing those savings to operate a light rail network leaner than proposed in the 2017 Next Network Plan. This proposal would keep the new Orange Line, but it would discontinue the Purple Line (also known as Almaden Spur) and end the Blue Line at Baypointe Station. 1. Discontinuing some all-day routes: Two all-day bus routes— 13 (Almaden) and 65 (Leigh)—are proposed to be discontinued due to low ridership. Route 13 is VTA’s second least-productive route, averaging 9 boardings per hour on weekdays, which is well below our minimum standard of 15 boardings per hour. Route 65 averages 12 boardings per hour on weekdays and is adjacent to a 15-minute route on Bascom and 30-minute route on Meridian that could be travel alternatives for Route 65 riders. Staff also proposes discontinuing Sunday service on Route 31 (Evergreen/Eastridge) and Saturday service on Route 53 (West Valley/Sunnyvale) due to low ridership. 2. Discontinuing some express and school routes – Express bus service, which operates only during weekday peak periods and in the peak direction, is among the least productive and least cost-effective service that VTA operates. Staff is proposing significant reductions in express service including discontinuing Express Routes 101, 122, 182 and 185. Additionally, the number of trips operated on Express Routes 102, 103, 121 and 168 would be decreased. VTA provides additional buses around bell times on routes that pass schools to accommodate student riders. Three of these extra services are proposed to be discontinued. An extra afternoon trip on Route 81 serving St. Francis High School in Mountain View and a special service on Route 66 to Santa Teresa High School are proposed to be discontinued. The 55X line that provides a direct route from Fremont High School in Sunnyvale to North Sunnyvale would be discontinued, but extra trips on Route 55 would remain to accommodate students—the routing would just be less direct. 3. Removing some route deviations – When buses deviate off their main corridors, it adds minutes to the overall travel time. This requires VTA to operate more vehicles on the route to maintain the same frequency of service, which increases operational costs. Staff proposes to remove the Homestead to Stevens Creek deviation of Route 81 as well as the Fair Oaks to Downtown Sunnyvale deviation on Route 26 (Next Network 56) that was part of the 2017 Next Network Plan. 4. Trimming hours and frequency in early morning and late evening – Staff proposes shortening the hours of service for many bus routes, generally by half an hour or an hour on each end. For example, a route that operates from 5:00 a.m. to 12:00 midnight may be shortened to 5:30 a.m. to 11:00 p.m.
Staff now also proposes ending 24-hour service on Route 22 on El Camino Real to Eastridge. In the draft 2019 New Transit Service Plan, service on Route 22 would start around 4:00 a.m. and end around 1:00 a.m. Transit agencies are asked to achieve two competing objectives: to maximize ridership and to provide service coverage to many places. Maximizing ridership leads transit agencies to provide frequent service where there is high transit demand but not in other low-demand areas. Focusing on coverage leads agencies to spread out services, with many routes going many places, but few that are frequent. Although ridership and coverage are both good goals, it is not possible to do both with limited resources. VTA must find an appropriate and difficult balance between spending its fixed budget on ridership or coverage goals. VTA’s current transit service spends about 70 percent of its resources on ridership-oriented routes and 30 percent on coverage-oriented routes. The adopted 2017 Next Network Plan would have changed that split to 83 percent for ridership and 17 percent for coverage. The draft 2019 New Transit Service Plan would move the balance to 90 percent for ridership goals and 10 percent for coverage goals. What this means for riders is that routes in places with high transit demand would see increases in service frequency. Routes 23, 26, 68, 500 and 522 would see increases in frequency compared to the Next Network Plan. Routes in areas with low demand would be reduced or eliminated. Many transit riders south of San Jose depend on a single route to access the greater transit network. For this reason, the VTA Board asked staff to avoid decreasing transit in South County. Routes 14, 17, and 19 in Gilroy would still be restructured into a bidirectional loop as proposed in the 2017 Next Network Plan, but service levels would not change. Route 16 in Morgan Hill would be renamed to Route 87, but would otherwise remain unchanged. 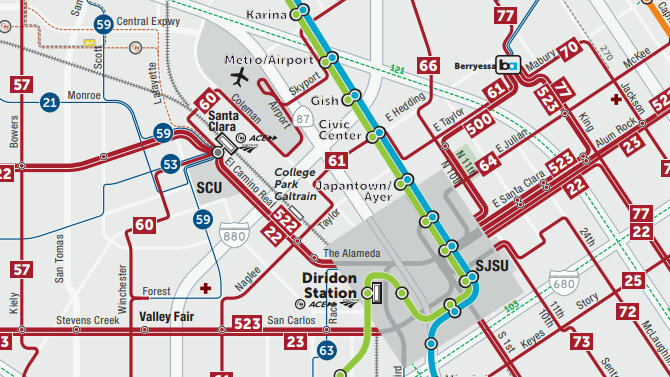 Staff is proposing to decrease the number of commute period trips on Express Route 168, which connects the Gilroy Transit Center with Diridon Station, from seven to five to better match demand without sacrificing rider convenience. VTA will hold six community meetings to collect input on the draft 2019 New Transit Service Plan. Meetings will feature a presentation from VTA staff and opportunities for the public to ask questions and provide input to the VTA planning process. VTA staff will also be conducting further community outreach in addition to the community meetings and will meet with other community organizations and neighborhood groups to discuss the plan.